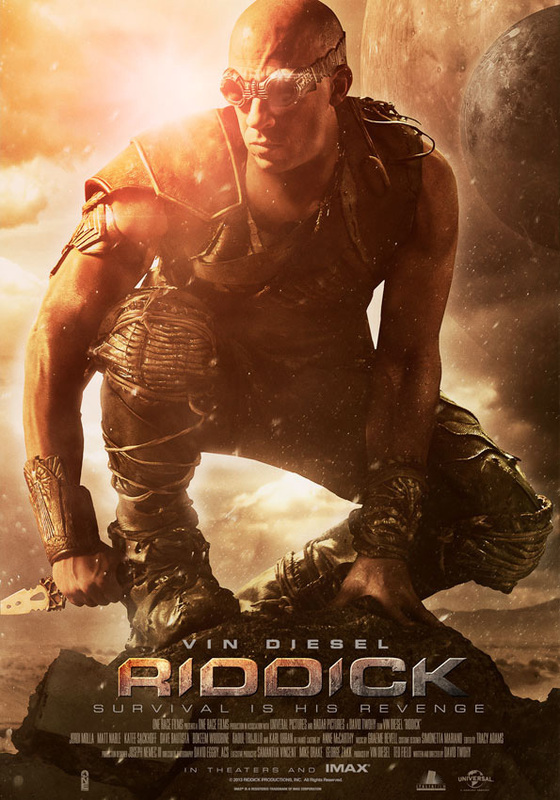 Riddick takes place a short while after the events of The Chronicles of Riddick and finds Riddick (Diesel) trapped on a planet he wasn't trying to be on. 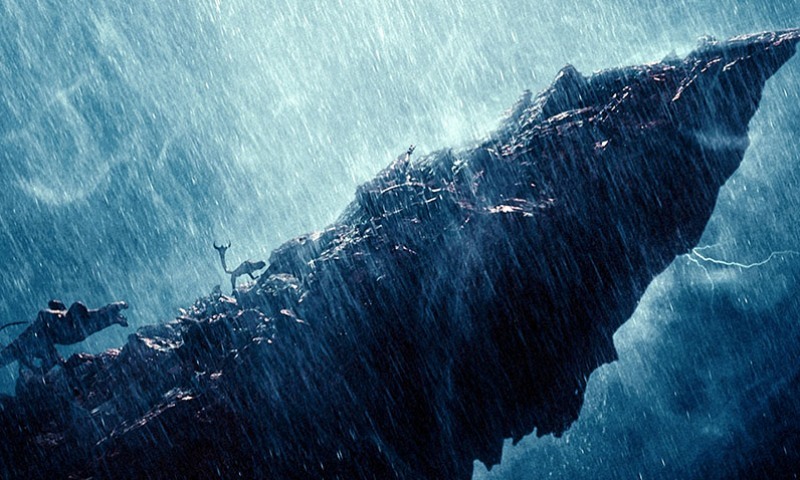 Its a similar plane to the one seen in Pitch Black although it comes with its own unique set of dangers and surprises. 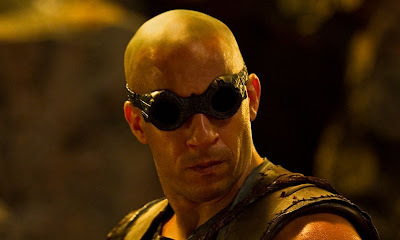 Injured and without any resources other than his body and brain, the bald guy with the glowing eyes must figure out a way to survive this ordeal and get back to participating in other science fiction adventures. 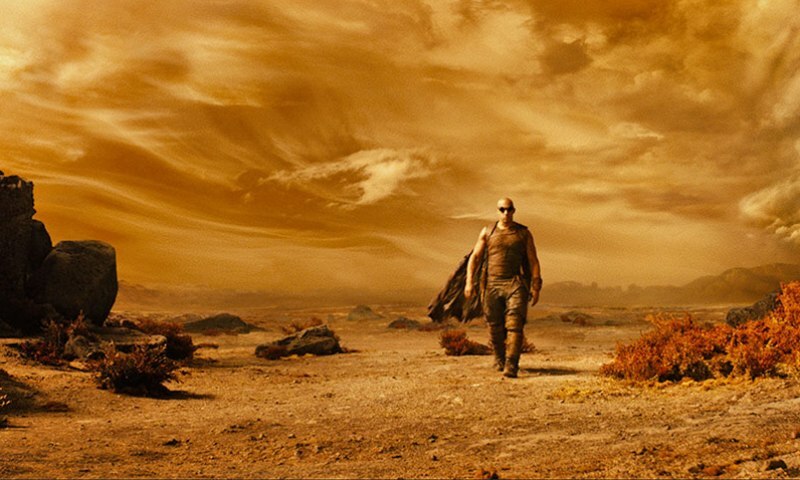 Fortunately for Riddick, he is very smart (except when it comes to walking around danger filled puddles) so he is able to escape some crazy looking creatures that want to eat him (except for the coyote like thing he ends up adopting). In another stroke of good fortune, the planet Riddick has been left on has a metal shed filled with supplies that is normally used by bounty hunters as they track down bad guys, or in this case...Riddick. After activating a beacon that will bring down a team of bounty hunters from...somewhere, he begins planning an escape that will take full advantage of the arrogance and stupidity normally found among the bounty hunting ranks. So, you would think that I just described what would amount to the first 15, maybe 20 minutes of a movie that would then go on to a larger scale adventure worthy of a hero as big and powerful (and marketable) as Riddick. Well, those thoughts are wrong as what I described above is pretty much the entire movie. Of course there is more to it than that (I never give away the whole thing) , but that is the basic setup for what you can expect to watch over the 119 minute run time. From a technical standpoint this is a pretty solid movie although all of the creatures are still a little too CGI which is a problem that may never be solved, but there are other movies that have done a much better job. There are a lot of cool devices and weaponry on display and the general look and feel of the tactile world on the screen is pretty impressive. 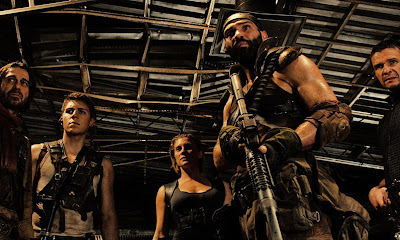 Where Riddick drops the ball is having a story filled with nothing but nonsense which is punctuated by some horrible acting which, to be honest, should be expected, but Diesel actually manages to lower the bar for what he is able to give to a character. There are so many times during this movie where you will either shake your head in amazed confusion or you will laugh at something completely silly that happens. You will ask yourself why didn't he just walk around and you will wonder why bear traps are used to capture hardened criminals, but through it all, you will actually be somewhat entertained. All that being said, Riddick isn't completely horrible and there are a few things to like (Katee Sackhoff is awesome!) but when the credits start rolling, you will most likely wonder why 20 minutes of story was stretched into a two hour movie.